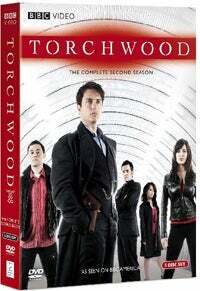 Does Torchwood Season 2 Work Better In One Sitting? The second season of Doctor Who's naughtier spinoff Torchwood just came out on DVD, and now's your chance to take it in as if it were a single, sweeping novel... with one or two chapters guest-written by a brain-damaged child. Watching the episodes a second time, all in one go, you get a sense that the show was trying harder to tell a coherent story than in its scattershot first episode. Torchwood season two starts with the introduction of Captain John, the lovable mass murderer who used to be Captain Jack's boyfriend and now pouts a lot. Captain John drops some hints about the return of Gray, Captain Jack's long-lost brother, and then we see more of their troubled boyhood in a later episode, featuring the memory-eating Adam. And then we finally meet Gray in the final Jack-burying episode of the season. The other huge thread of the season is the unrequited love between Tosh and Owen, which is complicated somewhat by Owen's death and resurrection, followed by their shared death. It's definitely hard to have a sustainable relationship when both people in it are dead. I wouldn't say that the result is exactly a great novel - it's more just sort of serviceable. Captain Jack, paradoxically, becomes less interesting the more we learn about him. Actually, the strongest episodes of Torchwood are still the standalone ones, where the team actually goes and investigates external threats, such as the alien sleeper agent, the alien meat plant and the evil AIDS-curing parasite conspiracy. It makes them seem like they're more important than just a group of people who fight amongst themselves and deal with their husbands and jealous ex-boyfriends. But yeah, I'd say DVD is probably the best way to watch Torchwood season two, especially propped up in bed with a giant mug of cocoa and some rice crackers. That way, it all sort of blends together into a seamless opera of silly bits and running and crane shots of Cardiff. So why don't we pretend this is the paragraph where I talk about rendering and anamorphic and screen resolution and stuff? Okay, great. In terms of extras, the main thing the DVD offers is a disk of the "Torchwood Declassified" episodes which you may have seen when the show originally aired. (I don't know if they showed them on BBC America or not. They're basically like little 15 minute-ish featurettes about the making of each episode, with behind-the-scenes footage and interviews and stuff.) There's also a larger featurette on another disk, all about the many deaths of Captain Jack. It's funny and cute, but not necessarily newbie friendly because it doesn't really present Jack's saga in a coherent order. There are outtakes, which mostly consist of actors giggling. And then there are deleted scenes, most of which just add a little bit of extra "Owen moping" or "Jack flirting" to some of the episodes. Except for this one, which I've watched three times and still don't understand. This is like a sequel to the infamous "stopwatch banter" scene. What on Earth are they talking about here?